If federal workers can't do their jobs, we can't do ours. It's as simple as that. 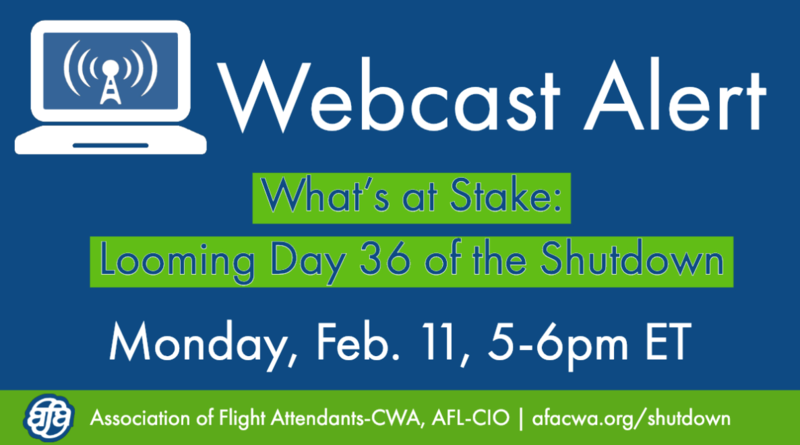 On Monday, February 11, please join AFA President Sara Nelson for a webcast with AFA members to review the threats to our safety, security, and jobs due to a continued federal lockout, and the steps we are taking to prevent the shutdown from continuing on February 16th. It is vitally important for our work that we understand fully what is at stake for Flight Attendants, all of the people on our planes, and every community that depends on aviation. Flight Attendants know how important federal workers like air traffic controllers, TSA officers, FAA safety inspectors and all federal workers are to our security, safety, and our livelihoods. During the unprecedented 35-day federal government shutdown, federal workers were stretched to a breaking point and had to stop work on safety and security initiatives, putting all of us in danger. Our activism and solidarity with federal workers helped end the shutdown, but if Washington can't reach a deal, the shutdown will continue into a 36th day on February 16th. Our lives and our jobs are on the line. We have to act. Many of the systems that were interrupted during the shutdown have not yet come back online. Our federal partners may have gotten a brief reprieve, but the uncertainty about a continued shutdown creates more stress. We cannot afford one more day, and our union is preparing actions to fight to prevent it.